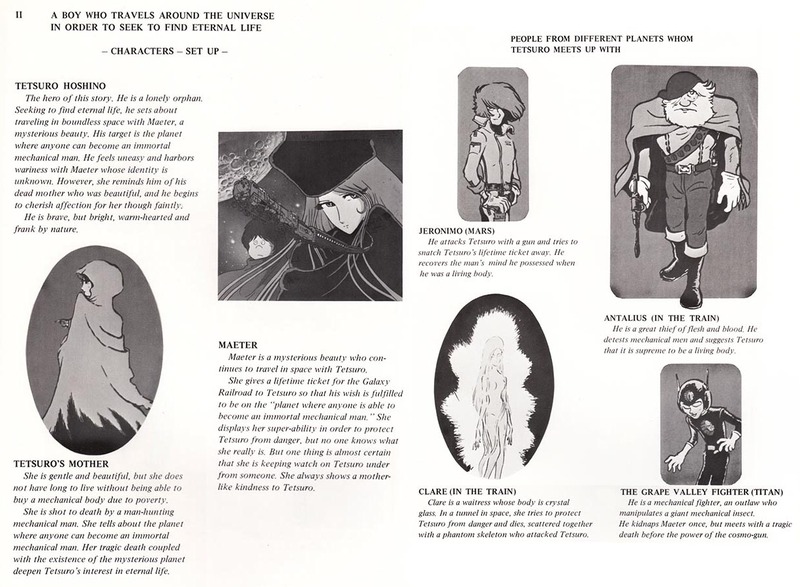 Previously at Let's Anime we discussed the English-language promotional book Toei used to sell their 1978 Captain Harlock television series to broadcasters worldwide. 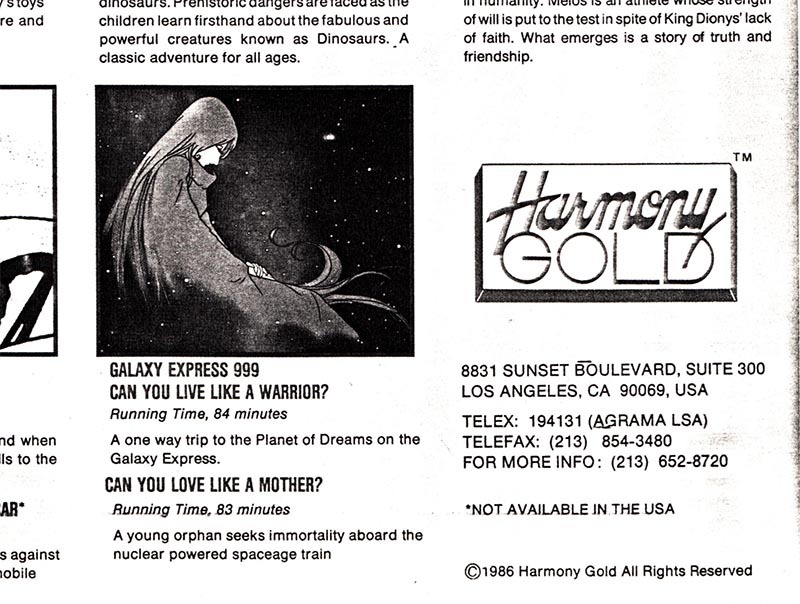 This time we're going to look at a similar publication, their Galaxy Express 999 pitch. Galaxy Express 999, the popular Leiji Matsumoto space-fantasy manga series about a young boy and a mysterious beauty travelling through space on a mission of self-fulfillment and revenge, ran in Shogakukan's Manga-Kun (later Shonen Big Comic) and became the basis for Toei's TV anime series that aired from September of 1978 until March of 1981, for a total of 113 episodes. France, Italy, Spain, Sweden, and southeastern Asia also saw the series on their respective television screens, but the series never aired on American television. Not really. We'll get to that. In the meantime, Toei spent the late 1970s pitching their then in-production series at various industry gatherings, and to that means produced an English-language booklet promoting the series. More philosophical than the action-oriented Captain Harlock, 999 must have been a harder sell to worldwide markets. First, the potential buyer has to accept the series' odd juxtaposition of "old fashioned trains" and "super science fiction interstellar travel." That's enough of a hurdle. 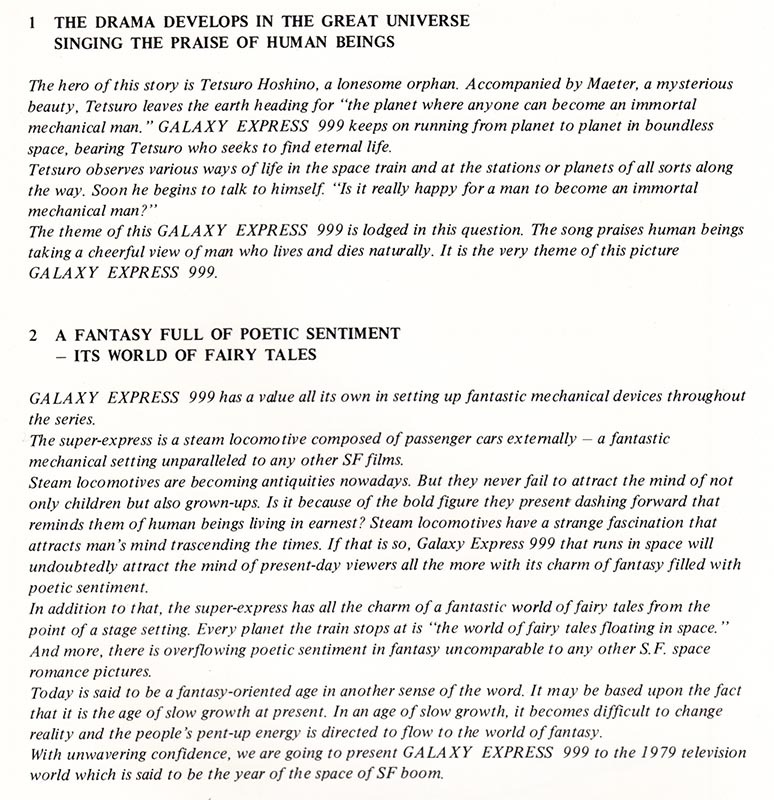 And then we're confronted with the larger themes of Galaxy Express, the emphasis the show places on "living and dying naturally," which might be a red flag to potential children's television markets that might not be ready for a show where somebody dies pretty much every episode. Having lost his mother, who was murdered by the man-hunting Count Mecha, the young Tetsuro's only wish is to reach the Mechanized Planet in Andromeda. 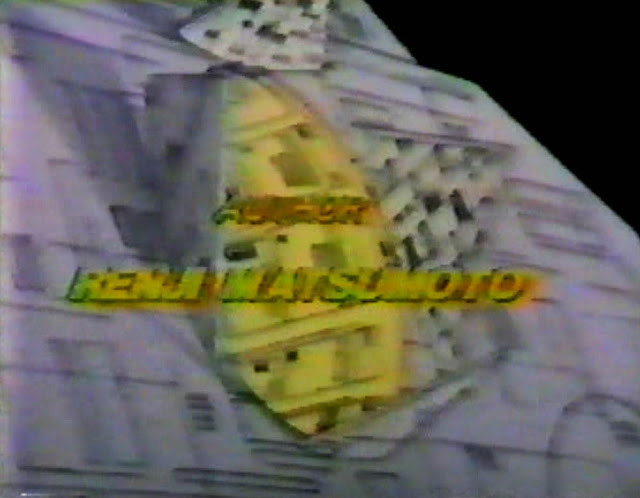 On the Mechanized Planet, eternal machine bodies are freely given to all who ask, and Tetsuro wants to become a machine man himself in the name of revenge. 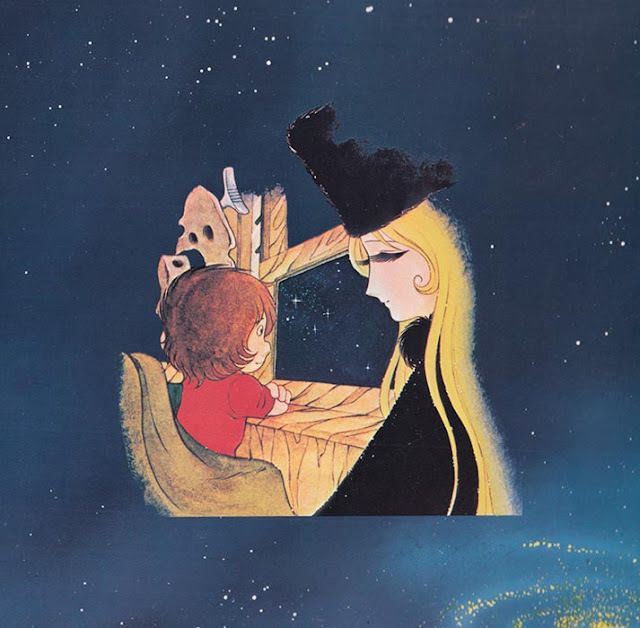 He is given an unlimited pass on the Galaxy Express 999 by Maeter, an aristocratic, enigmatic blonde who seems to have an agenda all her own. 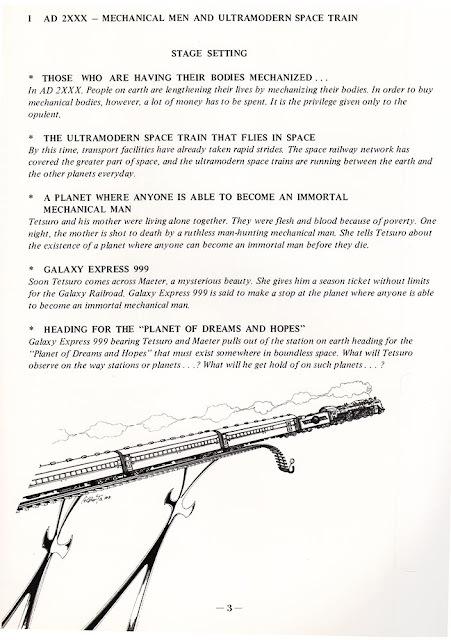 Together they ride the space-rails, stopping and visiting the various planets on the 999's schedule, where marvels and threats await at every station. Produced before the series had even aired in Japan, this book features illustrations taken from Matsumoto's manga and early production art of the 999. We learn about Tetsuro's tragic past and the mysterious Maeter (or Maetel as her name would later be translated), and we meet a wide variety of Galaxy Express 999 characters who die tragically, or meet with a tragic death, or who are drunken Tarzans who live on a drunken monkey continent, or who are shot to death by our hero. Again I point out how unlikely it would have been for a show this melancholic, this filled with violent death, to make it anywhere near American cartoon television in 1978, a year of Galaxy Goof-Ups, Fangfaces, and SuperStretches and Microwomen. 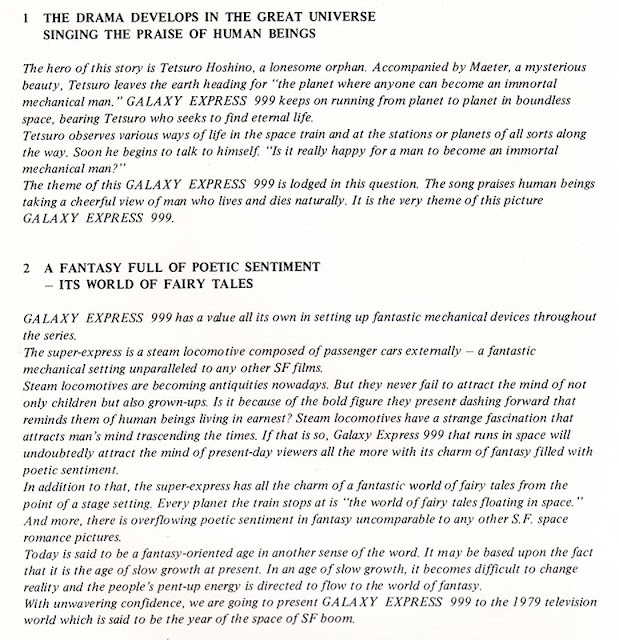 America's broadcasters passed on Galaxy Express 999, but the 1979 feature film was picked up by New World Pictures and screened in theaters across the US in 1980 as "Galaxy Express". New World's infamous yet not entirely charmless localization features celebrity impersonation voice dubbing and unfortunate name changes. A few years later, international film & television production company Harmony Gold would package two television movies compiled from 999 episodes for sale to English-speaking markets around the world. These two 999 telefilms, "Can You Live Like A Warrior" and "Can You Love Like A Mother", feature Intersound voice work and enjoyed spotty (and possibly nonexistent) release. 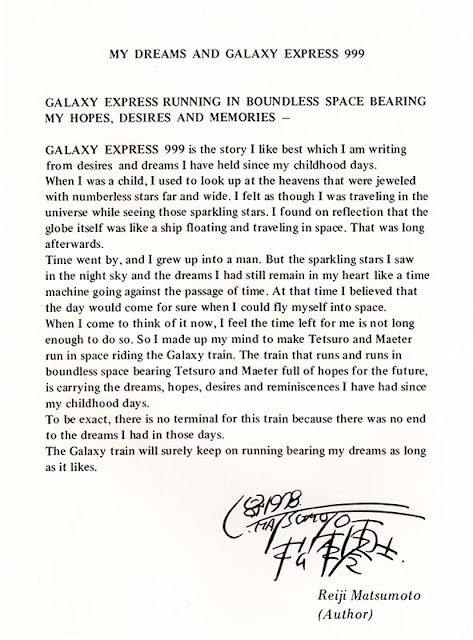 The Galaxy Express TV series would eventually find itself broadcast over the American airwaves on various Japanese-language UHF television stations, in the original Japanese but with English subtitles. This arrangement lasted until somebody at Fuji-TV headquarters in Tokyo realized that potentially valuable licensed properties were being broadcast without benefit of adequate licensing, royalties, or permission, and pulled the plug on everything. 999 would get a legitimate 2012 North American release on DVD from low-end media conglomerate S'more Entertainment in a box set that didn't quite meet expectations, being compressed badly and hard-subtitle encoded. The 999 films, on the other hand, would receive gentler DVD treatment from Discotek Media. 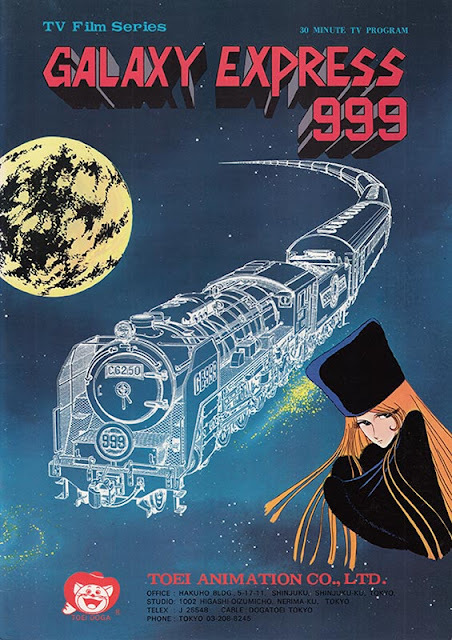 Galaxy Express 999 the series would finally appear on Crunchyroll, where the entire show is currently streaming along with Space Pirate Captain Harlock. Fascinating, isn't it, how these shows started out together as hopeful English-language pamphlets, only to see their paths diverge, meander, circle back, and come together again? As the pitch book puts it, that's some "overflowing poetic sentiment" right there.